Baldur's Gate: The Sword Coast Chronicles is a persistent world set in the Forgotten Realms that spans the southern end of the Sword Coast. The server is primarily a role-playing one, with a lot of opportunity for both role-playing and hack and slash adventuring. When players leave the cities or villages and go off exploring and questing, they enter a wilderness matched by few places in the Realms. The area covered has great potential to show off the Sword Coast and immerse players into a true Forgotten Realms adventure. To learn more about this PW, Urithrand talks to the BGTSCC Project Lead, Jlf2n. 1. SP: Firstly, for those who haven't played on your persistent world, could you introduce yourself and tell us a little about the Sword Coast Chronicles? Jlf2n: Hello, my name is Josh, and I have been a modder for about 4 years now bouncing around from game to game. My most recent work besides NWN2 is with The Elder Scrolls: Oblivion video game engine. I have been modding for NWN2 a little over a year now. I came to NWN2 as a player at first with the intentions of joining an existing team. As I was searching for a place to call home, I was disappointed that none of the highly recognizable locations of the Forgotten Realms had been built out as a PW. This is where The Sword Coast Chronicles idea first got its spark from. I wanted a place where players could feel like they had been before. A place that would tug at the heart strings. The original idea was to base it out of Waterdeep. 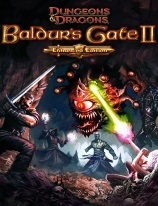 But once I discovered that Baldur's Gate hadn't been done, it was just too much to pass up. 2. SP: Designing a PW set in such a famously used region of the Sword Coast must have been challenging. How have you made sure you've stayed true to the original Baldur's Gate series while still providing players with new and fun RP ideas to play with? Jlf2n: We have gathered and used a ton of Forgotten Realms source material. From maps to paper backs, to web based supplements. We have scoured it all in the attempt to be as accurate as possible. We have also borrowed ideas from the original Baldur's Gate PC game which is widely recognized as one of the greatest RPGs of all time. We took what we thought was the best from both the video game and Pen and Paper worlds and built the foundation on which the PW sits. 3. SP: Having seen some of the areas first hand, I can vouch for the exceptional attention to detail when compared to BG. How long did it take you to make these infamous areas? Jlf2n: I started building these areas in November of 2007. Luckily for me there wasn’t much of a learning curve with the toolkit. I have used a few similar ones in the past with other games and most of the techniques I have picked up over the years were easily applied. Even though I had no idea how to build out the mechanics side of the online world, I figured if I built enough areas someone would feel sorry for me and help me out. :) Enter Driller, who is a well known PW builder of NWN fame. Driller was crucial in the early stages of development. Without his help the PW could have very easily ended up as a single player module. 4. SP: It's a well known fact that some players like to stand around a campfire and chat, while others like to run around killing goblins. Others still like to gamble, steal and sneak around. What problems have you faced overcoming the diversity of entertainment required by such a large population? Jlf2n: By offering the players as many options as possible. As you just mentioned, everyone has a different style. For those who like to chat, we have a mechanic called "Role-Play Experience". What it does is factor in things like proximity to other players, what type of chat is being used (ex. Tell, Say, OOC) among a few other things and rewards players for simply carrying on a conversation. For those who like to grind we have a large variety of dungeons and landscapes crawling with all sorts of evil. For the gamblers we have a card game (Beta 8) that allows them to use a deck of cards any way they see fit at the various inns and taverns located throughout the PW. And for everyone else, we currently have 15 single player quests, with more on the way. These quests are repeatable and reset once every two weeks. 5. SP: One thing that makes or breaks a PW is its DMs. What challenges have you faced ensuring you have quality, devoted DMs in your world? Jlf2n: It was crucial for us, especially at first to have a good number of DMs to keep people busy due to a lack of content. As we grew it was tasked to those guys to develop the DM team and find potential new DMs. They have been tremendous in not only recognizing potential DMs, but in the development of new DMs as well. 6. SP: Creating and maintaining a PW requires a massive input of time and effort. What makes all that effort worthwhile? Jlf2n: Just to see people enjoying themselves. When you first start building a PW it’s about what you want to see and what your goals are. As more and more people become involved, it becomes a community project. As you go you experience the highs and lows, ups and downs. For me personally, anytime I feel burnt out or fed up, all I have to do is log in and observe people having fun. When you see people truly enjoying themselves it makes it all worth while. 7. SP: An unfortunate side-effect of any online community is the attraction of unsuitable players. How have you ensured your community stays close to your original concept? Jlf2n: So far we have been very fortunate in this regard. Sure you have problem players every now and then with unrealistic expectations. But on a whole our community is as good as we could ask or hope for. 8. SP: Looking on your forums, we can see you have a massive number of joinable player factions. How do you ensure that your player population is not spread too thinly? How do you involve these factions in events? Jlf2n: That all depends on the player really. We make it so that they have options open to them. Maybe they aren't worried about DM interaction so much and are more focused on just being part of a guild they enjoy. Or, if it's DM interaction that drives them, they can join one of the more active guilds. 9. SP: Anyone who plays TSCC will know you recently released an Underdark area into the game. How have you overcome the pitfalls of using such a famous area? How long did it take to develop? Jlf2n: We didn't find any pitfalls per se. It was more of an awesome opportunity to bring an area that so many enjoy to our PW. The Underdark is arguably just as well known as the Forgotten Realms itself. Development wise we approached it as if we were building a separate PW inside our current one. Our first goal was to get enough areas in to release it as a beta. Now our goal is to expand upon it and flesh out enough areas to make it a full fledged PW in and of itself. As it stands the two aren't currently connected. In the future though we plan on bridging the two worlds for cross exploration. 10. SP: Are you happy with the result? Jlf2n: Very much so. I think we are having more fun building it than the players who play it. 11. SP: What would be your advice to anyone wanting to start a new character in Baldur's Gate: The Sword Coast Chronicles? Jlf2n: My only advice is to jump on in. The water's great!